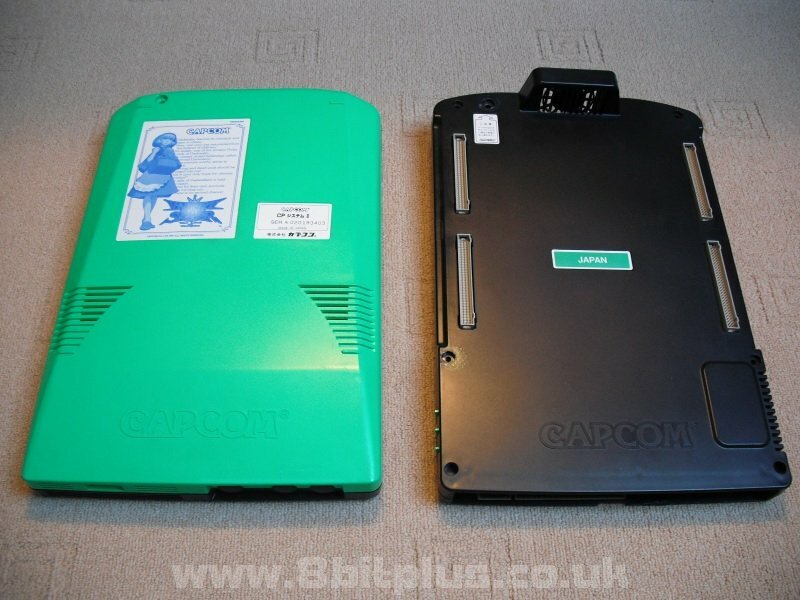 Overview and information about the Capcom CPS-2 arcade system. 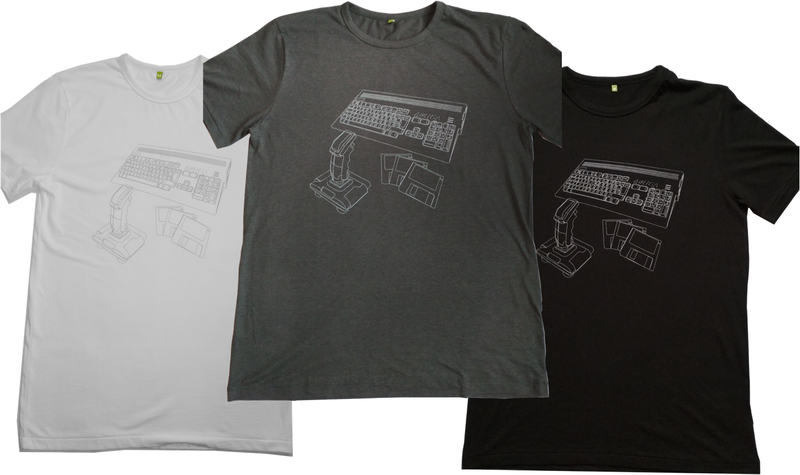 Covering hardware, piracy and games. The Capcom CPS-2 also knows under its proper name as the Capcom Play System 2 is a direct squeal t the original CPS developed in the late 80′s. The new system used the same Motorola 68000 that powered the original system (and practically all home computer, games console and arcade system at the time), but at a faster clock speed. The graphic system was largely upgraded as well to incorporate larger numbers of sprites at higher speeds. Capcom also included Q-Sound as a standard that first appeared on some CPS games. 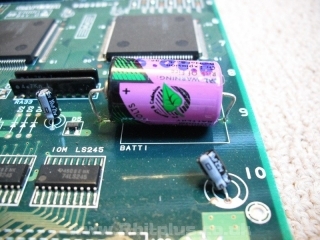 The original CPS games consisted of 2 main PCB’s. 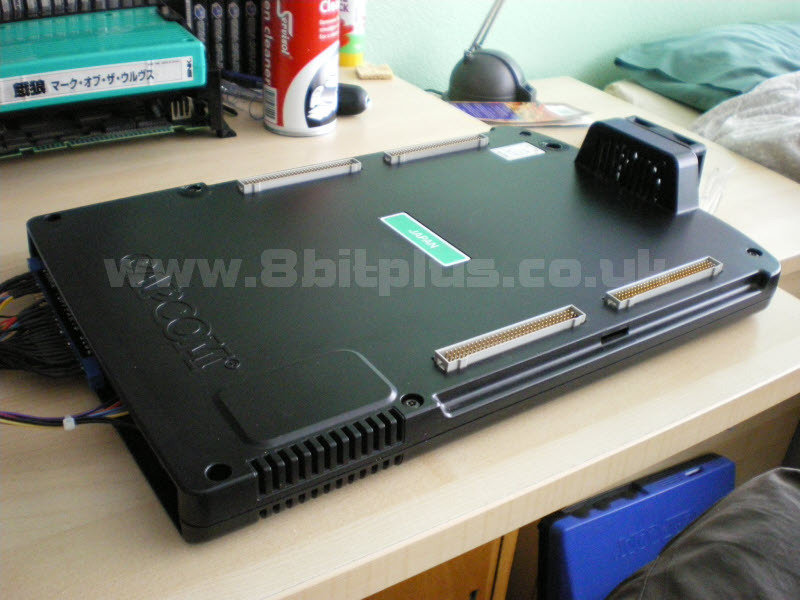 The lower board held the CPU, audio/video hardware, RAM and the Jamma interface. 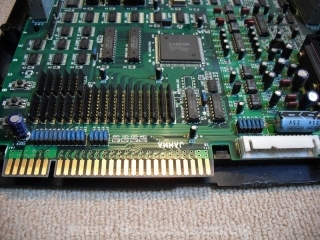 The top board held the game content in a series of ROM chips. This allowed the games to be sold separately to the Processor board, lowering the cost and hassle for arcade operators to get the latest games installed and running. 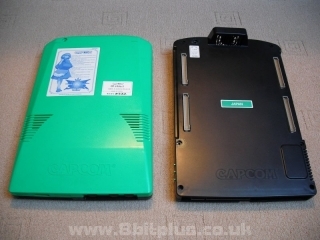 The Capcom CPS-2 uses the same principle and takes it a step further. The game and motherboard are each cased in protective shell. This keeps the boards free from dust and dirt that frequently builds up in arcade machines over time, and also almost completely removes any chance of static damage caused by improper handling at any point. The games cases are different to represent the different regions that the game was intended to be sold in. The Motherboard are also have a different colored label for the designated regions. One other important aspect that needed addressing from the old CPS system was that of piracy. With the boom of Street Fighter 2 came a huge wave of illegal pirate knock-0ffs and hacks. To address this problem Capcom encrypted all the EPROM’s that contain the game data with a special code. When the game is not in use (not connected and powered) then the encryption key is kept alive in the roms by a 3.6 volt lithium battery. When the power in the battery drops below 2v for a short length of time, the encryption key is lost and the game will not boot. This system is known as a suicide battery system. The normal life span of the battery is five or six years if the game is played regularly. I had one that lasted from 1997 on the original battery. This is only possible if the battery is exceptionally good quality and the game used almost all the time. I got the game from a arcade operator so that’s probably the case. For most people a CPS-2 game with a fresh battery should last over four years even if its not played at all. The encryption itself was very successful in that it wasn’t cracked until 2001 when the hardware was reversed engineered to allow games to be emulated in Mame. CPS-3 was only cracked in late 2008. There are a few people on the internet selling 18-in-1 pirate Capcom CPS-2 carts, but they are often buggy and unreliable at best. Often with missing sprites and sound data. A side affect of fully cracking the rom encryption was the ability to bring games back from the dead. This precess is done by replacing the original program code roms with new unencrypted roms from a special none-mame rom set. At the moment the only place to get your dead game running is to contact the guy at CPS-2 Shock. Changing the battery is a very easy job. Simply remove the solder from the motherboard around the battery legs, and remove the old battery. Then clean the board around the holes to remove any dirt or old flux. Next insert the new battery making sure to get it the correct way round (check original) and solder into place. You might have heard of “kick harness” in relation to Capcom games, and possibly other games like Midways Mortal Kombat series. 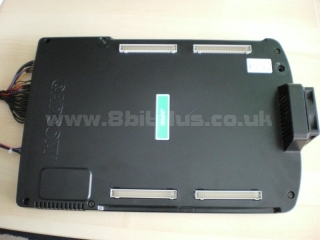 A kick harness is just another set of connectors on the game that allow the connection more buttons than the original Jamma harness supports. Jamma mainly supports 3 action/fire buttons for each player. 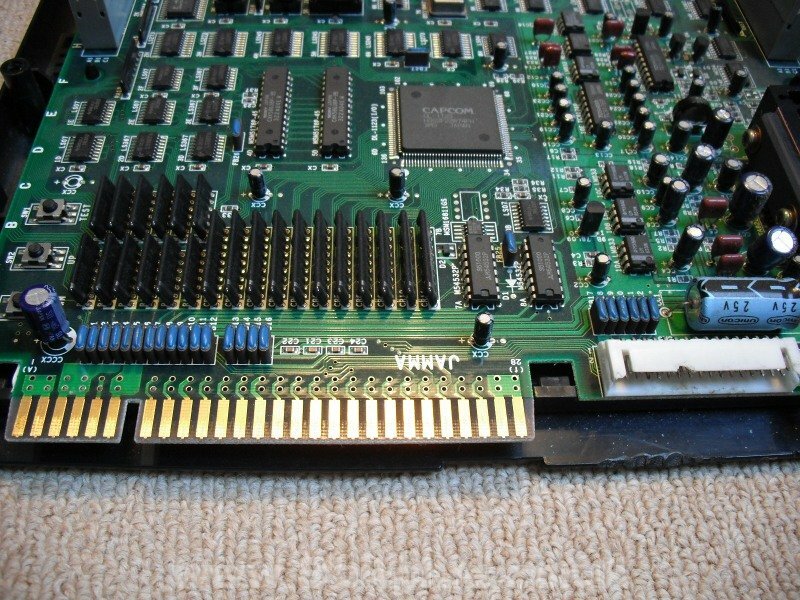 Neo-Geo MVS which is very smiler to Jamma supports 4 action buttons by using c/25 pins on the Jamma connector. Capcom fighting games from the original CPS through to CPS-3 all use 6 buttons, 3 for punch and 3 for kick. The punch buttons are located on Jamma harness and the kick buttons are located on the extra “kick” harness. The kick harness also has a secondary function to extend the volume controls, test and service buttons. The CPS-2 is the host to some of Capcom’s most memorable 16bit 2D Fighting games. Even though the total number of CPS-2 games is far lower than that of the Neo-Geo, the quality of the released titles is staggering. As well as fighting games it also has a few very unique and inspired shooters and platformers. Simply stunning 24bit high colour fighting action. Often over shadowed by the Street Fighter series, Darkstalkers/Vampire series is one of my all-time favorite set of games. The characters are all so well drawn and animated, with such attention to detail its a joy to play. SFZ3 is an outstanding addition to this family of games. More characters, more moves, and all the improvements made from the previous 2. The best from Street Fighter and the Marvel heroes. Its a bit like Marvel vs Capcom in that all the characters are faster and more powerful than they usually are. Couple that with a tag team crossover feature and you have a excellent fighting game. A great example of a Capcom shooter. The graphics are smooth and well drawn with plenty of detail. Without doubt the finest looking 19xx game ever. Another fine shooter. The amount of stuff on screen is staggering. Smooth action and a great sound track make this very fun and addictive to play. Capcom made a great port of this to Dreamcast in 2000. So apart from having to change the battery every 4 or 5 years a CPS-2 is a great addition to an arcade collection. They plug into most supergun’s and jamma compatible cabs with no modification other than the addition of a kick harness. For any fighting game fan then its a must. The games look great when lined up on a shelf and are by far the largest interchangeable games cartridges ever. As for cost, some of the older more common games can be found at a very reasonable price. I managed to get X-Men Children of the Atom for less than £30 on eBay a couple of years ago. Other games like Mars Matrix and other shooting games often go for very high prices, often over £200, but luckily its not too hard to pick up a set of Street Fighter Alpha’s and the Darkstalkers/Vampire games and good prices. If you have a Jamma cab or a good supergun then there is almost no excuse to not have some CPS-2 games in your collection. If you don’t then I have one word for you: MAME. These games are still great fun and thanks to their quality and detail, show no signs of aging.